If you want success with your WordPress site, you need the perfect theme. Go for a theme that is optimized for search engines and that is attractive. 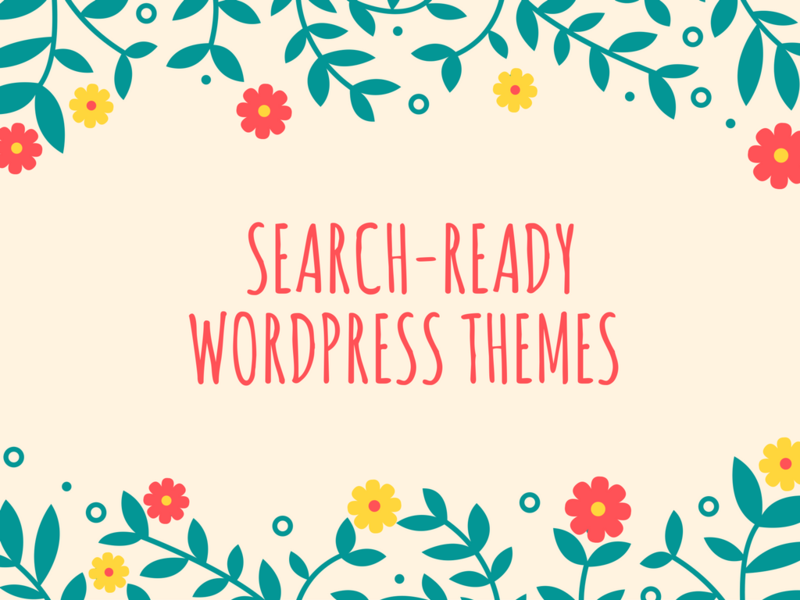 Below are examples of SEO-ready WordPress themes. This is a popular WooCommerce-compatible theme. It has powerful SEO plugins – WordPress SEO by Yoast. Notable features of the theme include high customization levels and support for WooCommerce. Google recently announced that loading speed is a ranking factor. The Schema theme comes optimized for fast loading speed. The Core by ThemeFuse collection is a premium WordPress theme that is marketed as 10-in-1 because of its many features, shortcodes, and options that allow for use in different business types. The theme loads quickly, thanks to its tight code. It also has other standard SEO features that are modifiable. The SEO module is like an additional plugin, but the options are built-in, allowing for easy and quick optimization. This is the fastest theme from Quema Labs, thanks to its minimalistic design and tight code. SEO optimization comes as a standard. Divi is reported to be the last addition to the Elegant Themes collection. It has a built-in SEO feature that can be enabled and disabled. It comes in 32 languages and is greatly flexible. Socially Viral from MythemeShop, the creators of Schema, also has in-built SEO options. It also has social share buttons, mega menus, and the WPSubscribe Pro plugin. Its design is meant to increase the time people spend on your site. This theme from ThemeIsle comes with SEO optimization as a standard. X Theme from Theme.Co looks complicated from the outside, but it is really simple on the backend. The theme gives you great loading speeds. Some of the theme functions are separated into plugins, meaning you don’t need to activate what you don’t need. This theme, as the name suggests, comes with SEO optimization as a standard. Noteworthy features include ranking tracker, keyword researcher, display of portfolio, mega menus, and drag and drop builder. You also get premium plugins, examples being the free live composer, social share button, and master slider. Eleven40 Pro from StudioPress is a beautifully crafted theme that combines functionality with aesthetics. Other than the advanced SEO optimization, the theme is completely responsive – something Google rewards. You get to choose from four color styles, footer widgets, and featured images, among other features. The best SEO companies in the city of NY have rated Foundly as the best WordPress template in the market today. Other than the SEO benefits, other advantages of using Foundly include social integration, ease of use, easy editing and navigation, and free child themes. Grimag, from the creators of Truemag, has a ‘dry’ code, meaning there’s no junk code. This makes it easy for search engine bots to crawl and index your website. A notable feature of this HTML5 theme is that it is translation ready, meaning you can use your vernacular to save the content. This is a fully responsive, fast-loading, clean-looking theme that puts content first. This means that other than SEO benefits, you also get improved user experience. If you are not happy with the standard layouts, there are extra features like ad banners, a theme options panel full of tools, and carousel sliders. Insider is a classic theme, having been released back in 2013, but it is still very popular, mostly because of its fast loading and the fact that it is search friendly. For those interested in earning money from PPC, the theme is AdSense optimized. This theme is best used for blogs, news websites, and online magazines. This is a magazine style theme from Tesla themes. It features 3 big images at the landing page and a call to action under them. The theme is optimized for SEO and for speed. This is a fully responsive WordPress theme that features speed optimization for improved user experience and for high ranking. Other notable features include the translation panel, unlimited color schemas, backgrounds, and layout options, and a solid frameword. This is a premium WordPress theme that is optimized for Google, Bing, and Yahoo. It has a professional yet simple design with beautiful typography. Notable features include interactive diagrams, project/product showcase, testimonials, and appealing slideshows and galleries. This is a 100% responsive WordPress theme that comes in blog and magazine layouts. Notable features include WooCommerce integration and custom widgets. It is optimized for AdSense, speed, and SEO. So, Why WordPress Sites Over Static HTML Sites? Being a CMS (Content Management System), a WordPress website will be easily managed from a user-friendly interface. All changes can be made on the admin area, as opposed to HTML sites where changes have to be made on the code. WordPress allows you to borrow from the thousands of templates, some free of charge. With a HTML site, the site design is only as good as the creativity of your designer. You can extend a WordPress site with plugins to add any functionality you can think about, such as adding a photo gallery, a reservation system, a contact form, social media icons, and so on, making it very powerful. You have to pay extra for such functionalities with a HTML site. You save money with a WordPress site because you do not need to hire a professional for coding and other small tasks. Unless you know HTML, you will need to hire a pro for every small task with a HTML site. The WordPress impressive community will give you free help, tools, and resources to help you make your site even better and to help you grow your business. Take advantage of the full site, content and domain name ownership and control you get with a WordPress site. You should not confuse WordPress.com with WordPress.org. The open source CMS is on .org while .com is a blog hosting service. Bill Williams works in one of the best SEO companies in the city of NY. He offers SEO, PPC, SMM, and other related services to companies in New York and beyond. He has a passion for teaching up-and-coming SEO professionals.